The "From Only" and "From Price" reflects the lowest price for this tour, which is a triple rate. 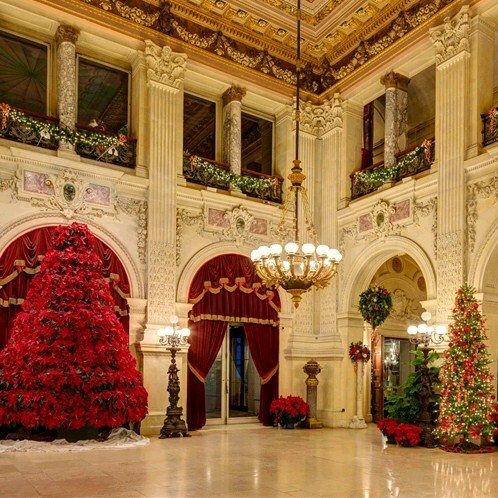 Celebrate Christmas in Rhode Island at the elegant, Gilded Age Mansions of Newport and Bristol! Visit four mansions fully decorated for the holidays. 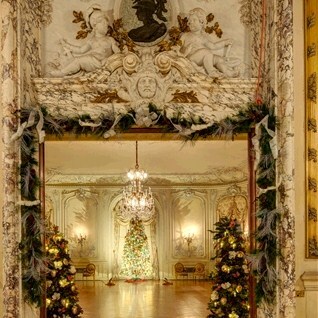 The Breakers Music Room at Christmas, John Corbett Courtesy of The Preservation Society of Newport County. 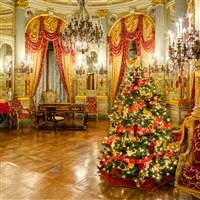 Celebrate Christmas in Rhode Island at the elegant, Gilded Age Mansions of Newport and Bristol! Visit four mansions, each uniquely and beautifully decorated for the holidays with period style ornaments, Christmas trees, wreaths, fresh flowers, ribbons and garland! Overnight will be in Connecticut. Time for dining, browsing, and shopping in downtown Newport along the busy harbor. 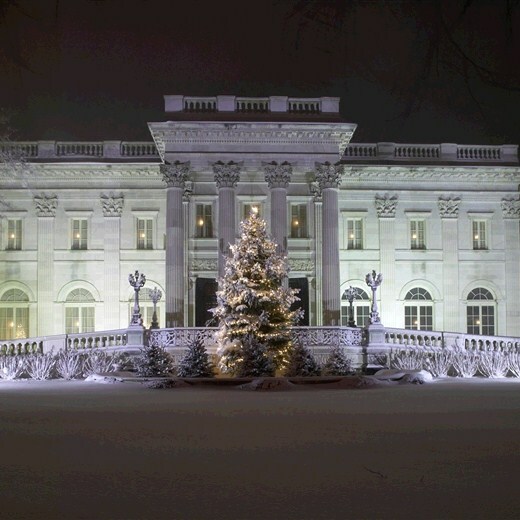 Enjoy Christmas at the Marble House, built by Mr. William K. Vanderbilt as a birthday gift for his dynamic wife, Alva, a leading hostess in Newport society who envisioned Marble House as her "temple to the arts" in America. Hotel for the next two nights is located in downtown Newport on beautiful Newport Harbor. 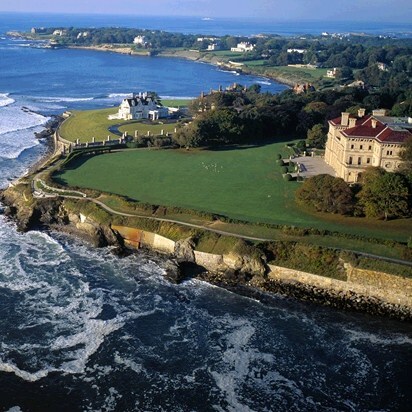 Leave for a driving tour of Newport's two famous scenic routes. The first is Bellevue Avenue lined with magnificent "summer cottages" built by summer residents the Astors, the Vanderbilts, and other Gilded Age leaders of industry and society. The second is Ten Mile Ocean Drive where you can ogle estates and enjoy un-paralleled ocean views! Touring continues to the lovely town of Bristol. Drive through Colt State Park and enjoy the sweeping views of Narragansett Bay! Experience Christmas at Blithewold, a 45-room mansion set on 33 acres overlooking Narragansett Bay with a tour and tea. Arrive at The National Shrine of Our Lady of La Salette. The Shrine's Festival of Lights has grown into a spectacular display during the Christmas Season. Experience a live concert with Father Pat the "Singing Priest". Free time to enjoy the annual Festival of Lights at La Salette Shrine, featuring over 300,000 lights, an outdoor manger, over 1,000 displays, angels, and snowflakes. Be sure to visit the Shrine's International Creche Museum displaying over 450 nativity sets from more than 50 countries. 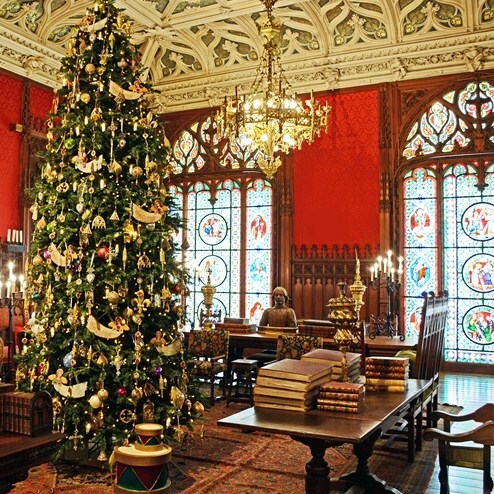 Experience Christmas at The Elms, a French-style chateau, which was the summer retreat of coal magnate Charles Berwind of Philadelphia, and contained every technological marvel of its time. 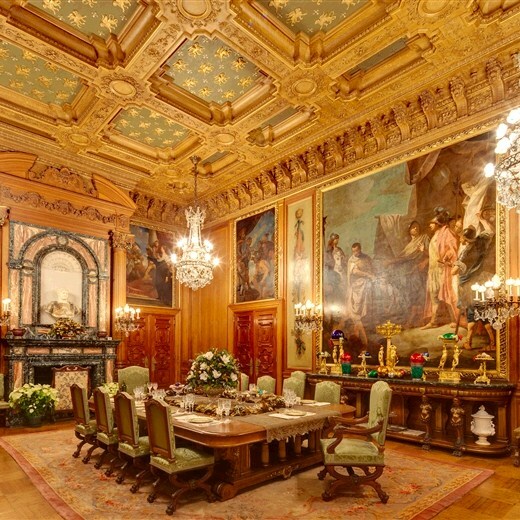 Then visit The Breakers, the grandest Newport mansion of all. Built for Cornelius Vanderbilt II, the 70 room cottage was inspired by the grand palaces in Genoa and Turin. Free time for holiday shopping in downtown Newport before heading to Connecticut for your overnight. 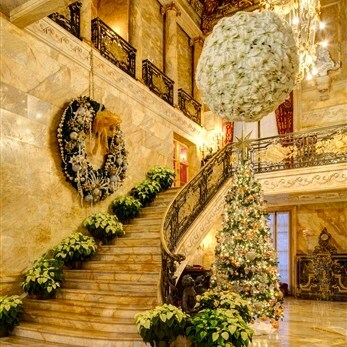 Return home with the glittering and dazzling memories of a Gilded Age Christmas. 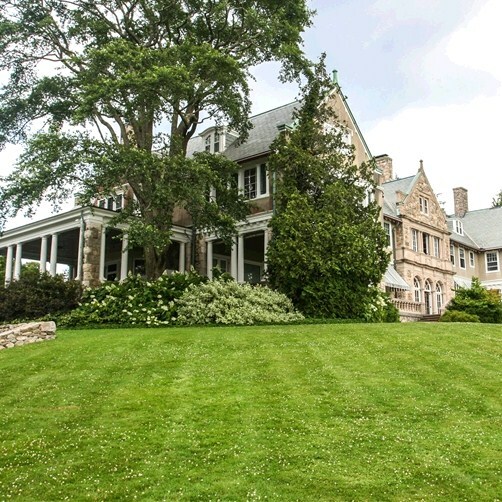 Includes: Transportation, two nights lodging in Danbury, CT, and two nights lodging in downtown Newport, four breakfasts, tea, dinner with lobster option, four mansion tours, local guide, touring and admissions per itinerary, baggage handling, and taxes. Walking code: 4 - This tour requires a heavy amount of walking. To truly experience the program and destination, you need to be able to participate in physical activities such as long walking tours, walking over uneven terrain, climbing stairs and periods of standing. Some of the touring days may be longer, with select included activities occurring later in the evening.